For Comic Relief at Anglian Lee Pointer and I decided it would be a good idea to get our legs waxed to raise money for Red Nose Day. How much do I regret it? Quite a lot, but it was for a good cause! 3pm marked judgement hour and I have been dreading it all day. Any Anglian employee was allowed to have a go at ripping off a strip as long as they had donated at least £1. To my surprise the first one didn’t hurt as much as everyone had said, and Lee seemed to agree, but the rest were painful! It was a weird sensation, more a sting than anything else, but the feeling afterwards (apart from being smooth) is indescribable. Right now, minutes after having it done, my legs feel like they belong to someone else. I did feel sorry for Lee as he has much hairier legs than me, but nonetheless he let people pull away on his legs. 25 minutes later and we have run out of waxing strips and each have a pair of unusually patchy legs. 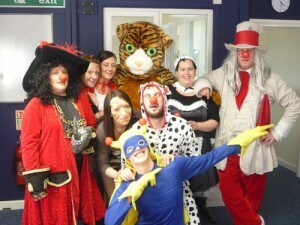 I then went to visit Paul Kemmetts telecanvassing team who have raised £150 between them by coming into work in fancy dress. Paul also did a sponsored silence lasting 5 hours! I managed to break it when asking him if he wanted to be involved in the picture. D’oh! Anglian Home Improvements supporting Comic Relief in many different ways. Visit the Anglian website for information on our home improvement products.